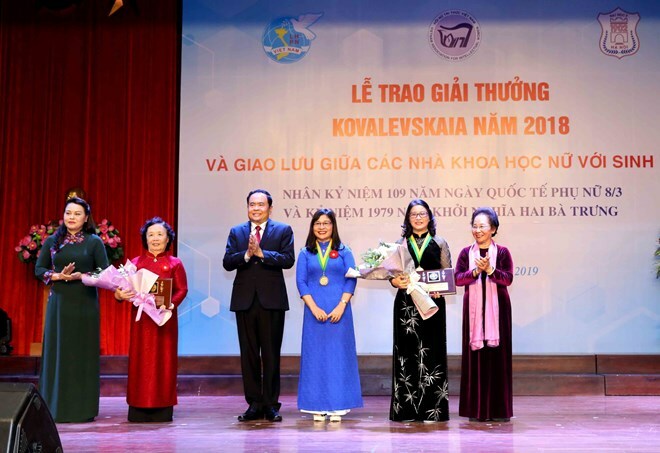 She was granted the award for 2018 at a ceremony held by the Vietnam Women’s Union Central Committee in Hanoi on March 4. Lan, born in 1974, has obtained remarkable achievements in scientific research. She has made 105 scientific announcements in Vietnam and overseas with many products applied to agriculture, including the rapid test kit for the porcine reproductive and respiratory syndrome, also known as blue-ear pig disease; and the microbial product used to make biological padding in livestock farming. The Kovalevskaya Award 2018 also honoured a group of female environmental technology scientists at the Faculty of Environmental Science of the University of Science, a member of the Vietnam National University-Hanoi. They were awarded for many attainments in researching waste treatment and reuse technologies, and those analysing and assessing environmental quality. Their research findings have helped create a system for treating dyeing wastewater, a system for treating groundwater with high arsenic levels, and biological measures for wastewater treatment. The award, named after Russian female mathematician Sofia Kovalevskaya, is presented annually to honour female scientists with major achievements in scientific research and application. It was first awarded in Vietnam in 1985. The Vietnamese Kovalevskaya Award Committee is currently chaired by former Vietnamese President Nguyen Thi Doan.